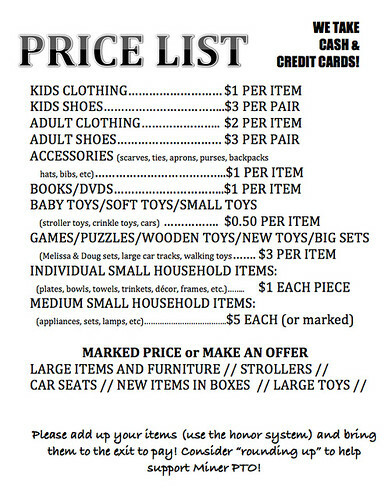 It's time again for the Miner Elementary Annual Community Yard Sale. 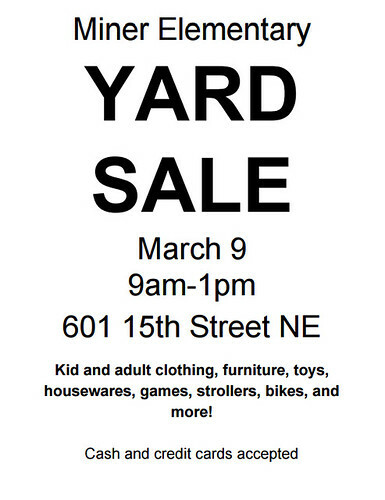 The sale will be held on Saturday, March 9 (9am–1pm) at the school (601 15th St. NE). All proceeds from the sale will go into the general fund of the Miner PTO, a 501(c)3 charitable organization. The organizers are currently accepting donations for the sale (a great excuse to de-clutter). You can donate items Monday–Friday, Feb. 4 through March 8 during school hours: 8am–6pm. Let the security guard at the entry desk know you're there to drop off donations. Drop your items in the area in the Main Office marked “Yard Sale Donations.” Due to space constraints, they cannot accept donations of furniture and other large items until the week of March 4. They cannot accept car seats. If you would like a donation receipt for tax purposes, please email the organizers at minerpto[at]gmail.com. The sale will include clothing for adults, kids, and infants; baby gear, furniture, housewares, decor, toys, games, and more (at great prices). Cash and credit cards will be accepted for payment. If you can't make it to the sale, or don't have items to give away, you can also make an online donation to support the Miner PTO. The organizers will also take certain E-waste and hazardous waste off you hands 9am–12pm the morning of the sale. Be sure to check the District's list of acceptable items for each category. If you are interested in volunteering to assist of the day of the event please check back later at the yard sale link as they will add information soon about volunteer sign up.